An intoxicated moped-rider found himself the target of an unusual police chase in Bavaria, Germany, on Tuesday afternoon. Dodging a vehicle spot-check in the town of Bamberg on, a 27-year-old could surely never have anticipated how the quick-thinking police officer would chase after him. The fugitive dumped his moped and made a break for it on foot, with the policeman hot on his heels. But the officer was stopped in his tracks and forced to abandon his vehicle when the pathway became "too narrow for a car to drive through", police spokesperson Gahn Silke said. Instead, he spotted a child’s bicycle which was fortunately unlocked. So without further ado the opportunistic policeman hopped on and set off in hot pursuit of the elusive man. 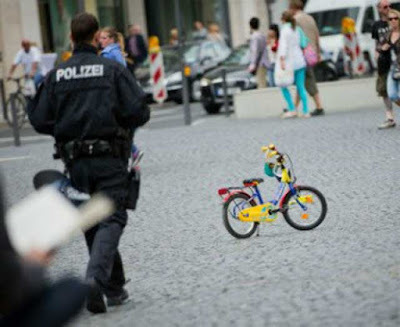 The tiny bicycle proved to be a wise choice, as the officer was finally able to catch and arrest the fugitive. It transpired that the errant runaway's crime was three-fold. He didn’t have a driving licence for his moped, he had been driving whilst "heavily under the influence of alcohol and drugs," and he was harbouring more narcotics in his rucksack, Silke said. The policeman then returned the bicycle after successfully arresting the intoxicated escapee, to its small owner's "absolute delight". The link to the article notes that the photo accompanying the article is unrelated to the article. As I posted there, I think someone needs to contact the bike's manufacturer to talk about advertisements and testimonials.